I’m not a fan of all the stress around Christmas time. I don’t like shopping under pressure or being bombarded by ads to buy last minute gifts. Sometimes I just want to pull the covers over my head and wake up when the holidays are over. But then I am reminded of the beauty of this time of year—the lights, the trees, the aromas, the spirit, and that cosy feeling of being warm inside when its chilly out—and I get inspired to make things! Nothing gives me greater joy than or baking seasonally inspired treats for the purpose of sharing them with others (...or for sharing the recipe with you!). To me, this is what Christmas is all about. 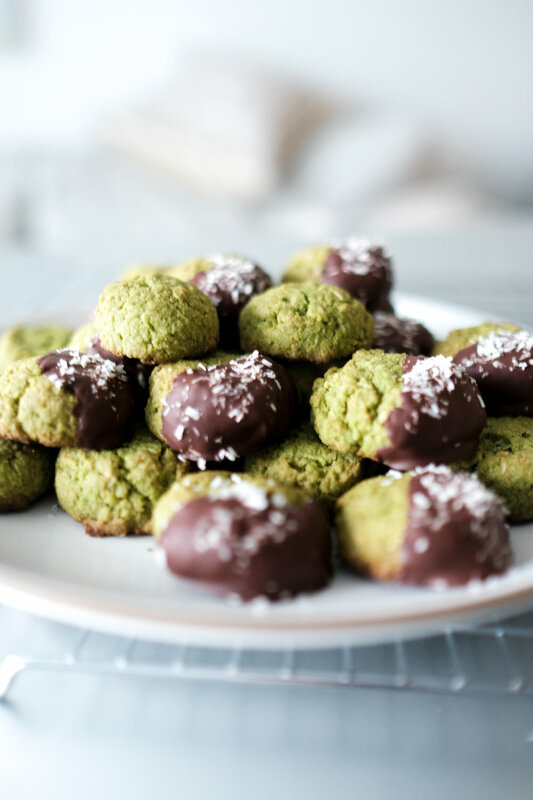 So, here we are only a few days before Christmas with these chewy Matcha Coconut & Almond Cookies. These cookies are super easy to make. 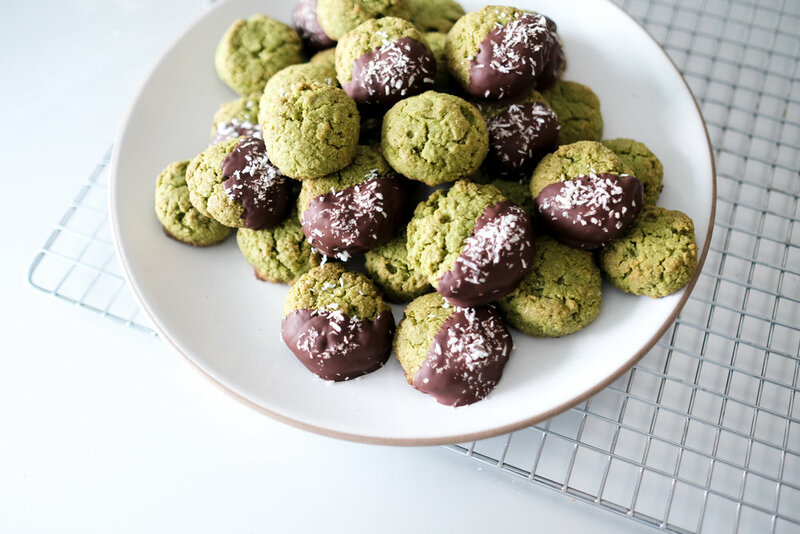 They are vegan, gluten-free, only require a few ingredients, and are a healthy-ish twist on a macaroon. 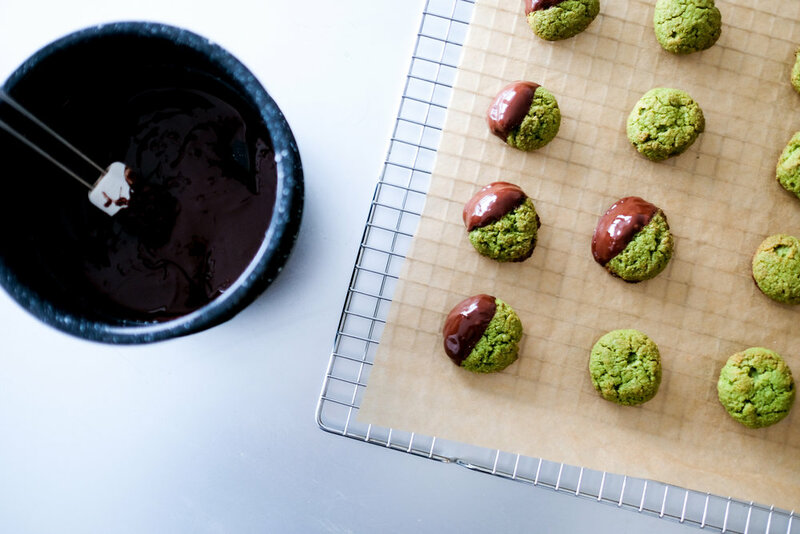 Matcha gives them a nice earthy flavor and also colors them a seasonally appropriate green. 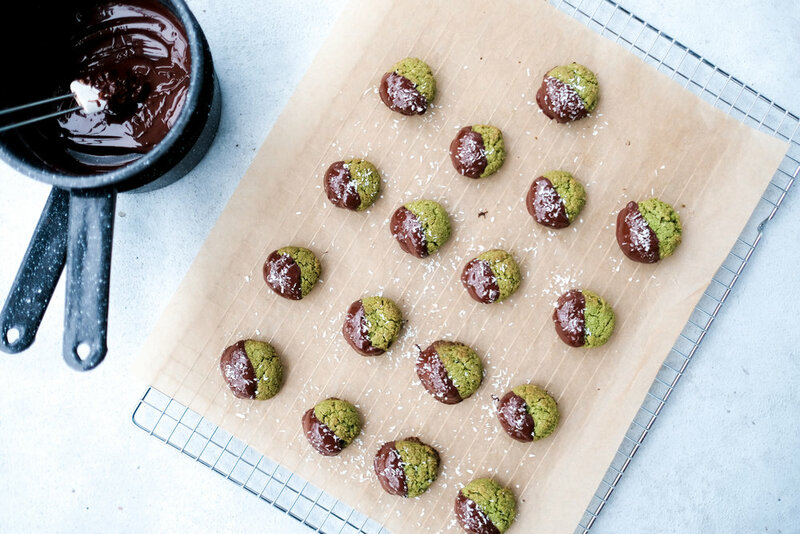 If you really want to Christmas-them-up-a-notch, you can add peppermint and dip them in chocolate! Pictured in this post are two batches: plain matcha, and peppermint chocolate. Surely you will please the crowd if you bring both to your holiday party! makes approximately 16 cookies. 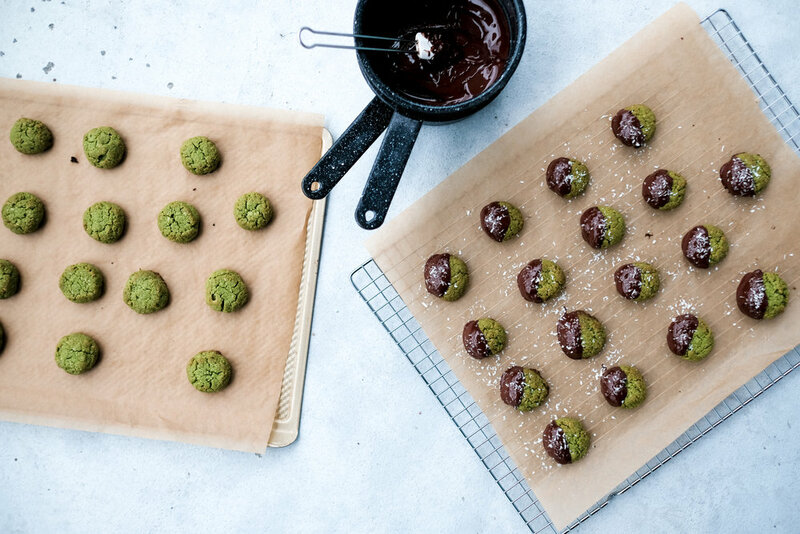 There are two batches pictured in this post: 1 made with peppermint & dipped in chocolate, 1 batch is just plain matcha! Both are delicious! Pre-heat oven to 350° and line a baking sheet with parchment paper. In a medium bowl, using a fork, mix together all dry ingredients: coconut, almond meal, matcha, and salt. Add all wet ingredients: maple syrup, coconut oil, vanilla and (optional: peppermint extract) to the dry and mix throroughtly. Place tray in the oven for 13-16 minutes. Bake less for a greener & chewier cookie, bake longer for a nicely browned, less-chewy cookie. It’s up to you! If dipping in chocolate, slowly melt the chocolate using a double boiler. Once cookies have cooled, dip into chocolate. Sprinkle with coconut and then wait for the chocolate to harden (you can speed up the process by putting them in the fridge). Share with your family and friends AND enjoy!